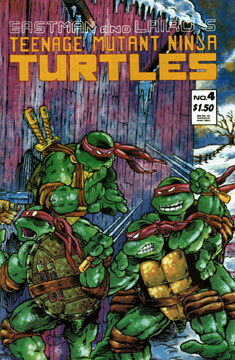 Issue four opens with the Turtles out exercising on the rooftops of New York City. Not too surprisingly, members of the Foot Clan show up and attack the mutant terrapins. Also not too surprisingly, the TMNT whip the New York ninjas thoroughly, although Mikey receives a serious cut on his arm. The fight ends and Raphael notices that the building directly beneath them has the TCRI logo. The Turtles, a bit freaked by finding the place that created the ooze that created them, decide to investigate… but not until they go to April’s place to patch up Michaelangelo. Once everyone is rested and rarin’ to go, they head back to the TCRI headquarters. Donatello uses a clever ploy to defeat their security cameras (a puppet of a pigeon), and the lads make it into the building. The Turtles sneak around for a bit and then stumble into a bizarre techno lab. The guys find Master Splinter housed in a stasis tube, where he is being held in suspended animation. As Raph prepares to shatter the cylinder, the Utroms arrive in their robotic bodies armed with laser stun-guns. A fight breaks out, and ends when the TMNT poise themselves in the middle of a strange device that the Utroms won’t fire upon. Michaelangelo attempts to vault over the Utroms’ heads to find an escape route, but his injury causes him to fall out of control. He crushes the control panel for the machine that the other three mutant Ts are standing upon, causing it to activate! Mikey is grabbed by an android as the device energizes. 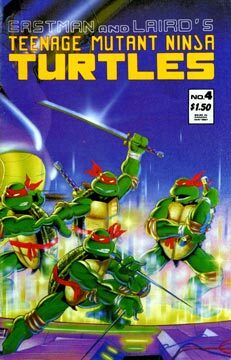 Leo, Raph and Don are enveloped in cosmic rays as Michaelangelo frees himself and dives onto the machine to be with his brothers… wherever they may be going! 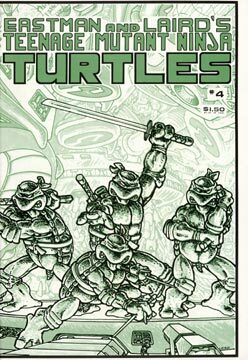 Misprinted Cover: The second printing of TMNT #4 and the first issue of “Tales of the TMNT” volume one went to the printer at the same time, and unfortunately the image for the “Tales” cover was used on the first run of #4. These books did make it into the distribution chain before the error was discovered. The misprinted cover version was recalled and 59,000 of the 60,000 misprinted copies were destroyed (thanks to Dylan Arsenault for supplying this info).